This is a stunning example of one of Leon Dabo's late 1940's Hudson River views. Painter, muralist and lithographer, a distinguished artist known to museums, curators and collectors worldwide. An American artist born in France, Dabo’s active career in art extended over a period of 80 years. He painted both in New York and France between the two world wars. He studied with some of the most influential painters of his day, John La Farge, Puvis de Chavannes, and James Abbott McNeill Whistler. Dabo’s first teacher in New York City was John La Farge [1835-1910] where he followed La Farge’s artistic philosophy, that art should embody “more than a mere representation of external appearances,” that views of nature should transcend the physical and appeal to ones emotion. La Farge is also credited with Dabo’s introduction to flower painting. In his early years in Paris, Dabo was a protégé of the renowned painter and muralist Puvis de Chavannes [1824-1898] many of his early landscapes owes much to his mentor in muted tonality, and evoking a dreamy quiet mood. 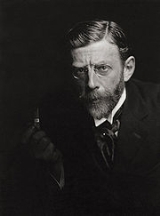 In 1888 Dabo settled in London where he associated with such artistic personalities as James McNeill Whistler, Walter Sickert, George Bernard Shaw, Alvin Langdon Coburn, among others. But it was James McNeill Whistler [1834-1903] who had a profound and lasting influence on Dabo’s art. He closely followed Whistler’s theory of “Art for Art’s sake,” showing the close relationship between the soft, tonal quality of color with the careful placement of composition into decorative and harmonious elements. 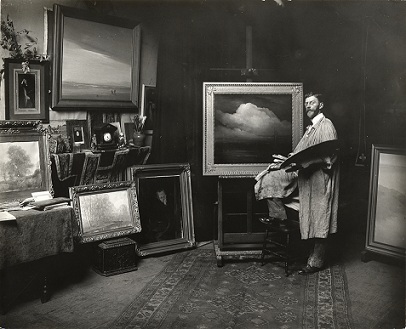 Dabo was involved with and participated in two of the major events in the American Art scene; the Independents of 1910, and the Armory Show of 1913. His travels abroad between 1917-1920 as a member of the American financial Mission to the Allies, allowed him to meet other important artist’s of the day, and to study their work. Dabo was commissioned by the Army’s Fourth Division under Major General Mark L. Hersey to execute five paintings depicting landscapes of historic sites during the first World War. Dabo continued to paint and exhibit in this country and Europe until his death in 1960, where he strove to realize new color sensations, mastering his use of light, texture and atmosphere. The Musee de Lourve, Paris, France, “Citadel”.